A few weeks ago I had a note from a reader asking about how they could motivate themselves. The issue arose when I had told them in a previous conversation how it’s impossible to lead a motivated team if you’re not motivated yourself. Not only is this a real issue for managers, but it also is a huge issue for the self-employed person, solo salesperson, etc. First, shut out the negative voices. There are news websites I enjoy reading, but they can be filled with negative news. I don’t allow myself to look at them anymore. Same goes for some friends and others who I found were simply negative in how they look at things. I had to cut them off. Second, start the day thinking of the success you had the day or week before, etc. Third, make it your daily mission to help others achieve their outcomes. I don’t look at what I’m doing as selling. I look at what I’m doing as helping others succeed. There’s something about having that mentality that in turn shifts your mentality even more to do more helping! Finally, I don’t take anything too seriously. It’s easy to get caught up emotionally especially when we look short-term. (Yes, we celebrate success immediately in the short term, but that’s a different story.) When we view things long-term, we take a more strategic eye toward everything, and it helps our thinking. We then don’t get caught up on single customer issue, etc. We can’t rely on anyone else to motivate us. It’s our job! Let’s make this year one where we are motivated at a higher level than ever before! 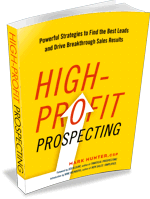 Mark Hunter is the author of High-Profit Prospecting: Powerful Strategies to Find the Best Leads and Drive Breakthrough Sales Results. Mark presented “Accelerate Your Sales Prospecting” at the February 2015 Institute for Excellence in Sales program in Northern Virginia. He nailed it and gave the 150 selling professionals and business owners in attendance amazing tips, strategies and tactics they could implement that day. The sales leaders at our program universally acknowledged Mark as one of the top speakers we’ve ever had. At our annual company sales meeting we’ ve never seen a speaker work so hard, with advance preparation, with such genuine style of delivery, and with such hunger for results. If you weren’t on the edge of your seat….you were in a coma. Period!